These last three months have been a crazy tired whirlwind. You rocked our world and we are still trying to pull ourselves out and into the fully functioning parental side of things. I won't lie and say it's been the best three months of my life and I kind of side eye others that say that it is the best. It's been tough, but worth it. The month of July was probably my favorite. We had a schedule of sleeping until 9 and you only woke up around 3ish and 5ish. I could handle that. Then you went through a growth spurt and started an every 3 hours thing for a week and ever since I just don't feel like I will ever catch up with sleep. And honey, I need sleep. So do you by the way, so perhaps you should stop fighting us when we put you down to bed. Mmmm.. kay? Thanks. We've watched you grow long and strong and the determination in your eyes, scares the crap out of me. I've already seen that you are just as bit as stubborn as me and your father. Which, will take you far in life, but I will let you know now, it will also land yourself grounded a time or two, since I am after all the adult. ;) You refused bottles of all kinds for almost 3 weeks and then magically, Tuesday night, I tried and you sucked it down so fast I was in shock. Coming right after your daddy tried for 2 loong hours I was gone. Since, you've sucked down 2 other bottles for grandma. Thank you. One less thing to worry about when I start working next week. Working is another topic we should address. I always planned on staying home with you darling, but realized that I kind of wanted to work a bit. So a part-time teaching position came up and I took it. I hope you don't hate me when your world gets rocked and you have to join 7 other babies in the infant room next week. I'm sorry. I'll try to find something better for you. However, sharing/adjusting never killed anyone. You're tough, you'll survive. I believe in you. It's so amazing to me that when you first arrived, you barely made a peep unless it was screaming to let us know how pissed you were. 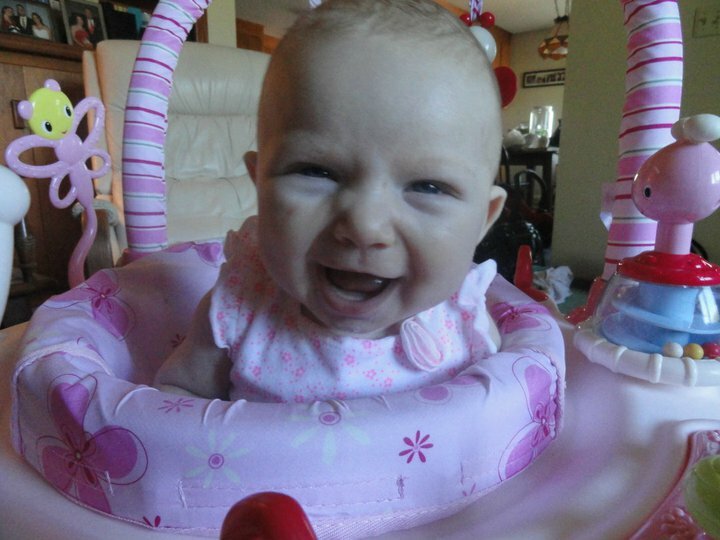 Now you are smiling, cooing and even laughing at us. You are standing, looking around, sitting up. Wow so much so fast. You want to grow up and that's okay, I want you to as well. That is what you are supposed to do, and I'm okay with that. I also apologize for not doing anything to your baby book. And for never finishing hanging the stuff up in your room. You'll realize we don't decorate well around these parts. Anyway, three months have flown by and I'm sure the next three will as well. What's For Dinner This Week.. Suggestions for September's Group Read! Wordless Wednesday Because I'm tired..
10 weeks post-partum... time to get moving!